Yum, those look really good! These sound SO yummy! 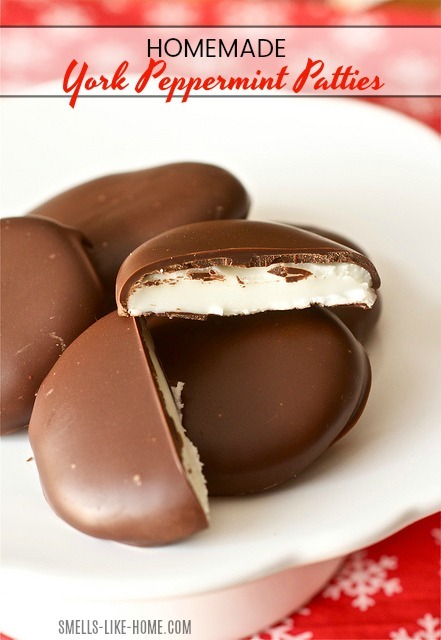 I think I may try these using chocolate molds….it may ease the pain of dipping them! I’ve been meaning to make these for a while now. They sound so darn delicious! Yum, I’d be thrilled to receive these! OH MY GOSH. I love peppermint patties. Making them homemade? Even better! These look fantastic… and fun to make! I have everything I need to make these in the pantry. How cool to make homemade! Can’t wait to try them. Wow, your chocolate coating looks impeccably smooth! Sara: They will be fine at room temp for a few days or you can store them in the fridge. I didn’t freeze any though, sorry. Thank you! Looking forward to trying these very soon! I just made these, and they are delicious! I used canned coconut milk in place of the sweetened condensed milk as I am dairy-free. It did take a lot more powdered sugar to make them solid enough to form, and even then I had trouble with them not freezing all the way and sticking to everything. What I eventually did was spread a small layer of chocolate in the bottom of a mini muffin cup, freeze, put a lump of peppermint filling in the middle, freeze again, and then top off with another layer of chocolate. 1/3 of a batch made just over 50 of these. To answer Sara’s question, mine have frozen beautifully so far, but it’s only been 24 hours. The dipping was very difficult for me. I think the butter makes it too stiff for dipping. I ended up putting the choc chips alone (no butter) in a zip lock baggie and melting in the microwave for a 15 to 30 minutes kneading the baggie with the choc chips after every interval. When it was at a good melted state I then drizzling onto mints. Spreading if necessarily. Deliciously Tasty. The dipping wasn’t easy because the patties can warm up and get soft but the butter, unless the chocolate cools too much, will only help to thin the chocolate out – it shouldn’t make it thick.